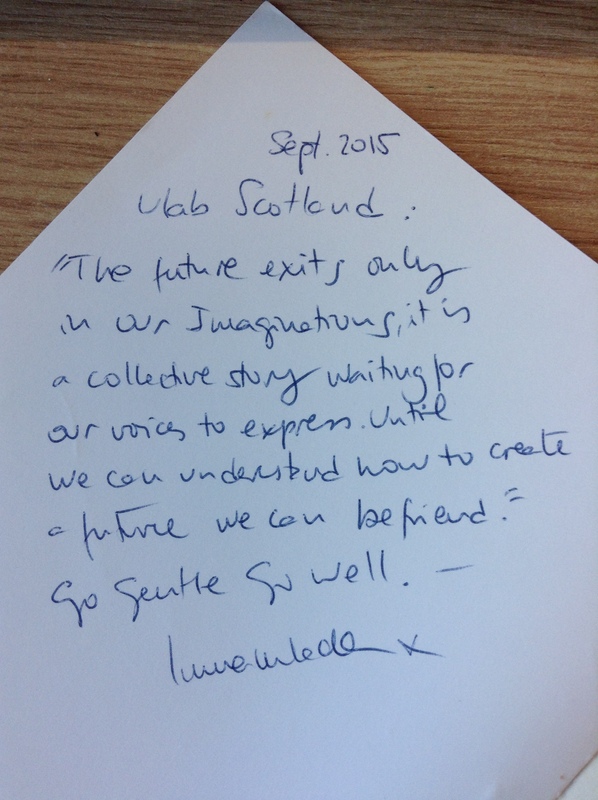 We have organised a venue in Edinburgh for anyone connected to U.Lab Scotland to join us in watching the last live session – book your space here: http://www.eventbrite.co.uk/e/u-lab-scotland-live-session-and-gathering-tickets-18604169572. We hope the date doesn’t clash with Christmas lunches or poor weather! Before the live session starts, we will have some time to share what has emerged for each of us and then a short session after it for ideas of what happens next for U.Lab Scotland. And there is a possibility that Scotland will be included in the live session itself with us having some air time to share our stories! We now have over 900 people in Scotland and over 800 people from the rest of the world registered as part of our U.Lab Scotland community. We’ve posted the findings from the “who we are” survey on edX under U.Lab Scotland in week 8. Thank you to everyone who has met, skyped or spoken to us by phone to tell us what has been emerging for you. There are some themes emerging that we will share will you soon. It’s not too late to be included in this – just get in touch with us by email or phone and we can arrange for you to share your experiences with us. We, in the Scottish Government, will continue to support the ulabscot community going forward in the run-up to U.Lab starting again next Autumn and look forward to working with you on how we might best do that. 4. We need your help to share your story with the community!! Help to host the short time we have together in Edinburgh on 17 Dec before the live session starts to enable everyone to share their own stories. In this vein we hope to run a workshop in the next few weeks to chat through possible themes. This will enable us to use that time as effectively as we can. Write any reflections on this journey we’ve been on through a blog post. If you want to get involved in any of the above or feel you can help in any other way, please get in touch with Keira (at Keira.Oliver@gov.scot).